Mark 1:32-34 ESV – That evening at sundown they brought to him all who were sick or oppressed by demons. And the whole city was gathered together at the door. And he healed many who were sick with various diseases, and cast out many demons. And he would not permit the demons to speak, because they knew him. This passage is very closely tied to my earlier post, Healed for a Purpose. The book of Mark flows so quickly, it seems that scene breaks are everywhere. We read this passage, and the main thrust is a view of Jesus healing people from the town. “The whole city was gathered together at the door.” Who’s door was it? It was the door of the home of Simon Peter’s mother-in-law. Remember how she had just been healed? She jumps out of bed to serve Jesus and His disciples. Then, afterward, they all sit down and drink tea and relax, right? WRONG. After She’s done serving them, the whole city comes to her house to be healed by Jesus. She is allowing some scary things from her town into her house. I think we can infer from the text that this wasn’t commonplace for her. She was probably just a normal lady living a normal life until Jesus. Now that she’s been healed, not only is she called to serve Jesus directly, but also the townspeople. She’s letting in the sickest, the poorest, and the demon-possessed. They are coming into her home to meet Jesus. Do I do that in my city? I’ve been healed by Him, and I’m trying to serve Him, but is my door open for the poorest and the sickest? Would I allow a demon-possessed person into my house, knowing that Jesus is going to heal them, or would I be too frightened? 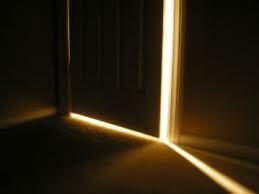 Do we trust God enough to have an open door policy?